A group of right-wing English Defence League thugs gatecrashed a Newcastle upon Tyne book club meeting because they mistakenly thought author and comedian Russell Brand would be present. Around 15 men, reportedly members of the far-right English Defence League (EDL), descended on the book club after receiving a tipoff that “Revolution” author Brand, whose book was the evening’s topic, would be attending the event. Dan Jenkins, who attended the event, told The Chronicle the group was perplexed when the men began shouting Islamophobic chants in the middle of the discussion. 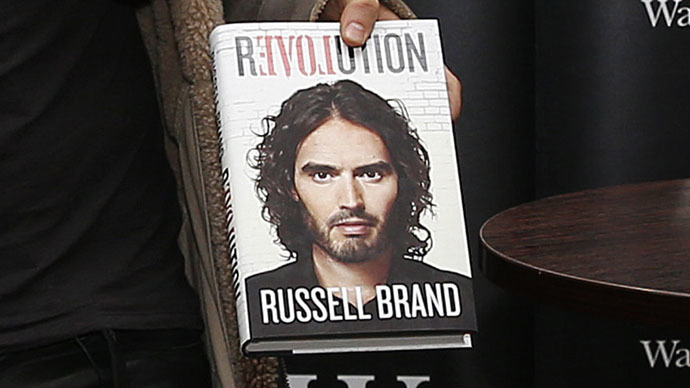 “It was an open book club to discuss Russell Brand’s new book. But the guys from EDL clearly thought he was going to turn up himself, so had gathered a group together from all over the North East to come and disturb the meeting,” he said. “I got there a bit late so I was sitting among them at the back and I could hear them talking about it and asking when he was coming and then 20 minutes in they realized that he wasn’t coming so they decided to be disruptive,” he added. Regional EDL organizer Alan Spence claimed activists attacked the meeting in retaliation for similar disruption meted out on their events by left-wingers. Jenkins said onlookers were bemused by the invasion rather than threatened. Agle Dubinkaite, manager of the bar hosting the book club, said she called the police after the men refused to leave.